Indy Datta revisits Walter Hill’s influential 1978 car-chase classic, released on Blu-ray today. 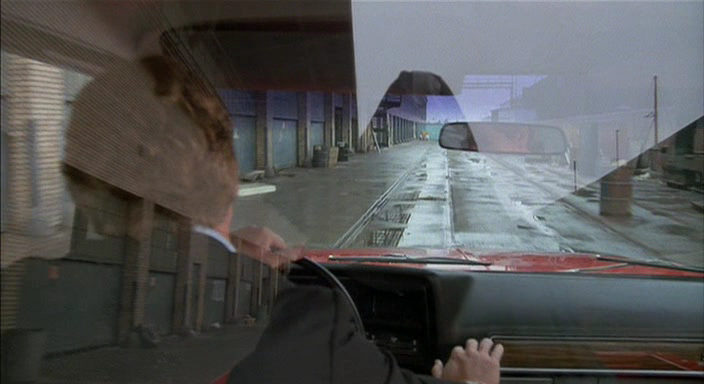 The Driver was Walter Hill’s second film as director, and initially developed as a vehicle for Steve McQueen, with whom Hill had previously worked on Peter Yates’s Bullitt and Sam Peckinpah’s The Getaway. The “Detective”, the antagonist to McQueen’s similarly nameless “Driver”, if Hill’s first casting instincts had been realized, would have been played by Robert Mitchum. In the event, the two leads were played by Ryan O’Neal, possibly trying to channel some of McQueen’s inscrutable cool, and Bruce Dern, nervier and less authoritative, maybe, than Mitchum would have been. The Driver was a flop on its initial domestic release, and it’s tempting to wonder if that would have been different if it had starred McQueen and Mitchum. Probably not, in truth. Hill’s film, like much of his better work, was a blast of cold air that both subverted and renewed genre conventions in ways that have always alienated both mass audiences and respectable critics, but which also mean it is as fresh today as it was then, and the shadow of its influence inescapable. Taking cues from tough, terse influences like the Melville of Le Samourai and the eerily underpopulated paintings of Edward Hopper, Hill stripped away everything extraneous to his vision. Characters are unnamed (the third lead, played by Isabelle Adjani in her first American film, was credited only as “the Player”), but more importantly are uncharacterised, reduced to signifiers, stripped of readable motivation beyond the drive to win (and, in extremis, the drive to survive) . In theory, the film’s halfway point comes exactly where all the screenwriting manuals say it should, when O’Neal’s getaway artist for hire makes the fateful and irrevocable decision to do that One Last Job, unaware that it’s a trap that’s been set for him by the Detective. But here this is a question of pure structure: there’s no question of this inflection representing the Driver’s potential to realize his best self, or the surfacing of his tragic flaw. It’s all a game, and as the Driver tells the Player, although there’s money at stake, it’s not about the money, and if he wins, he might even send the cash to the Detective. In the end, of course, the cash defeats both of them, and the Driver walks away with a shrug. Hill’s mode here (and also in, say, Southern Comfort – the scene where Les Lannom orders a member of his National Guard squadron to cover him with blanks!) is the action movie being eaten from the inside out by absurdism – and in this he’s tougher than the film makers most obviously influenced by The Driver. Michael Mann has on many occasions used the same starting point of two geniuses on opposite sides of the game locked in an existential struggle (and Philip Lathrop’s lensing of nocturnal LA is an obvious forbear to the digital nightscapes of Collateral and Miami Vice), but his preference for Freudian psychodrama makes his films vastly less lean and mean than Hill’s film. And in Drive, Nicolas Winding Refn lifted huge chunks of Hill wholesale, but Ryan Gosling’s Driver was always made to carry the burden of tragedy. In The Driver, Ryan O’Neal’s not carrying anything. Any prospect of a romantic entanglement with Adjani’s Player (a character whose motivations neither the audience nor Adjani ever get a handle on) is brusquely shouldered aside. He’s certainly not going to try and save her the way Gosling’s Driver does Carey Mulligan’s Irene. And the film, in the end, boils down to those sequences where nothing matters but the visceral thrill of how well the Driver drives (and of Hill’s genius for action choreography); to manoeuvring the plot from the opening sequence where he’s driving in flight from the law to the closing sequence, where he has become the avenging pursuer: to the fishtailing and screaming tyres of muscle cars on Los Angeles freeways, and the abstract play of skyscraper lights parallaxing back and forth across the blackness of the sky. Studio Canal’s Blu-ray seems to use the same transfer (sourced from Fox) as last year’s limited edition Region A Twilight Time release, which bathes LA’s night-time streets in an eerie green glow not seen in previous DVD releases. The effect is atmospheric: I have no idea whether it’s faithful to the colour-timing of the original film. The bitrate is lower than the Twlilght Time disc, but again, I have no way of knowing whether the sometimes somewhat dupey softness of the picture is a limitation of the disc, or of the source material. There’s no noticeable edge-enhancement or other digital ugliness and the linear PCM stereo soundtrack is clean enough. Extras are limited to trailers, and a brace of scenes deleted from the opening of the film, neither of which will enhance anyone’s appreciation of it.